"The authors of the book are internationally renowned experts in the field of multi-state modeling and have written an extremely clear and comprehensive book on the topic that covers many different aspects, from the fundamental theory to the practical side of analyzing data and interpreting results. The examples are well chosen to represent the most common types of multi-state processes that public health researchers could encounter. The inclusion of software code to illustrate how the models can be fit and interpreted is especially helpful to readers." "This is a very nice book that does not exist on the market yet, and the multistate models for example are not well covered in terms of text books. We here have a book that really takes the multistate aspect seriously and provides many genuine examples that are discussed in depth. I cannot recall seeing examples in such depth in other books that deal with similar topics. This is not easy to do but the authors succeed in this fully." 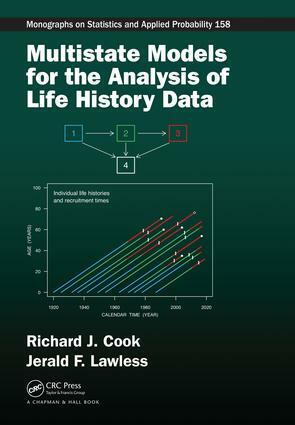 "This book includes a wide-ranging review of the use of multistate models for the analysis of longitudinal data arising from healthcare. The presentation is very clear and strikes a good balance between general description and rigorous specification of appropriate statistical models, including assumptions and limitations. Illustration of the methods using some substantive datasets, based on the authors’ experience of monitoring complex diseases, provides further insight into the value of different approaches. Both the level of detail and the pace of the arguments is very good."